Is the perfect time for renewed dedication to one’s knitting blog. I’ve been absent from here for a few months, and I’ve really missed it. The thing is, this summer I finished the research for my dissertation, wrote my dissertation and defended my dissertation. To say I was stressed out doesn’t quite capture it – I’m pretty sure my family was afraid I was losing it. 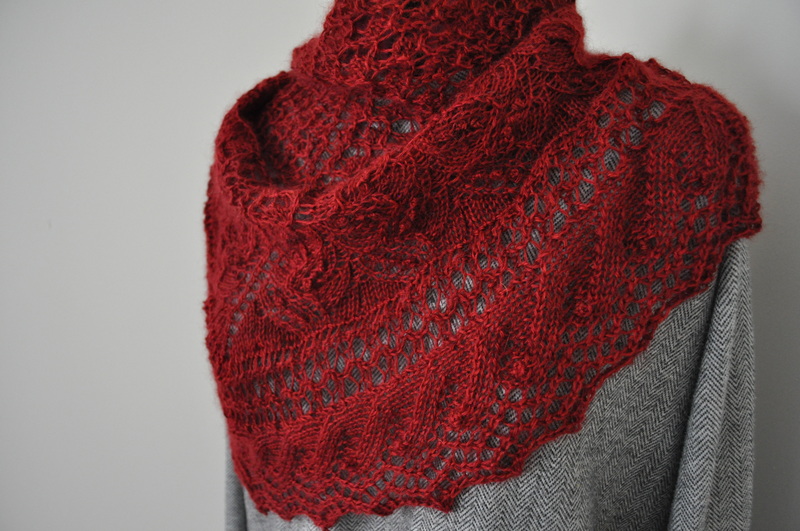 In April I finished knitting a ruby red shawl for my grandma, and then had an unusual experience. I found the “stress” of planning a new project – choosing a pattern, finding the right yarn for the project, making sure I got the correct gauge – to be something I couldn’t handle until some of the other things I was juggling were completed. Which is sad, since knitting is so therapeutic! In any case, once I was able to tick a few things off of my to-do list I picked up my needles again, and now that this whole summer of stress is over I feel ready to start posting again. So why don’t we start off with the last project I finished before the summer? When Sasha and I were visiting his family over last Christmas, we of course went yarn shopping and I scored some ruby red Wagtail Yarns Fine Kid Mohair. I originally planned to make the Willoughby scarf from Brooklyntweed’s Made in Brooklyn, but once I started knitting that pattern, I realized the mohair wasn’t the right yarn for it – the bobbles weren’t anywhere close to full enough! 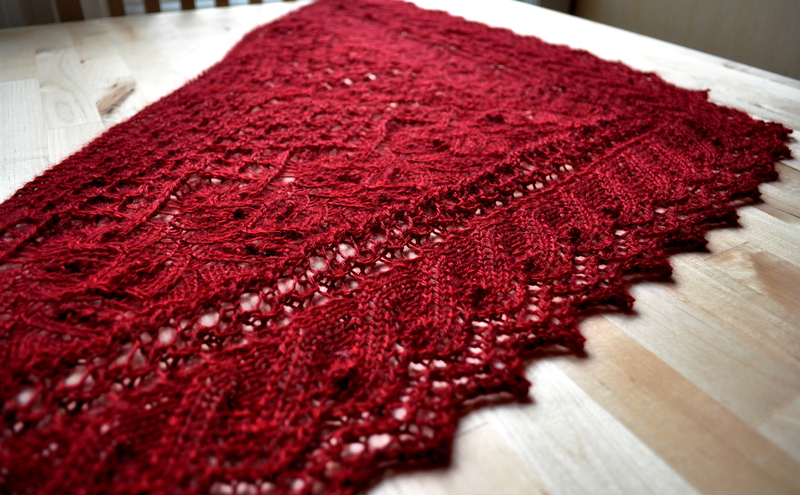 So I decided to save that pattern for later and use the Wagtail yarn for a different Brooklyntweed pattern – the Juneberry triangle shawl. I’ve been wanting to try out this pattern for a while, and this yarn seemed like the perfect color for it. Since my grandma loves red, I decided to make this one for her. The pattern has some complicated lace in it, with the pattern worked on both sides, not just the right side of the work. There is also a wide knitted on edging that creates this beautiful sort of faux cable pattern (with a bobble!) and a pretty open lace edge. 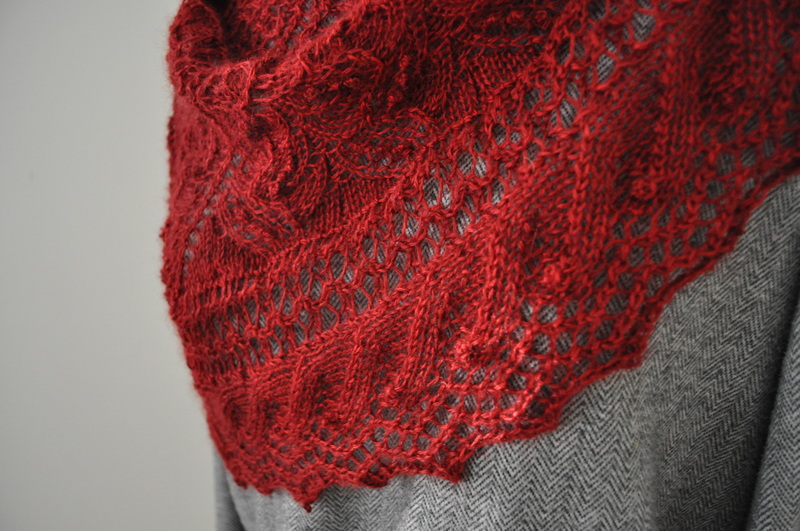 I love knitted on edgings – they seem like the perfect way to finish anything like a shawl or blanket – and this is the loveliest I’ve ever worked. I’ll definitely be using it again, maybe as a fancy edge to a simple garter stitch throw. The mohair yarn worked nicely with the pattern, although it’s still not quite lofty enough to make big, full bobbles. I like the sheen of the yarn and the color is perfect. I hope grandma likes it! I’m happy to offer my very first pattern, a simple cabled hat called Cable Me Pink. I knit this hat in a sportweight yarn with a little bit of mohair, but I think it would look lovely in a different type/weight yarn. 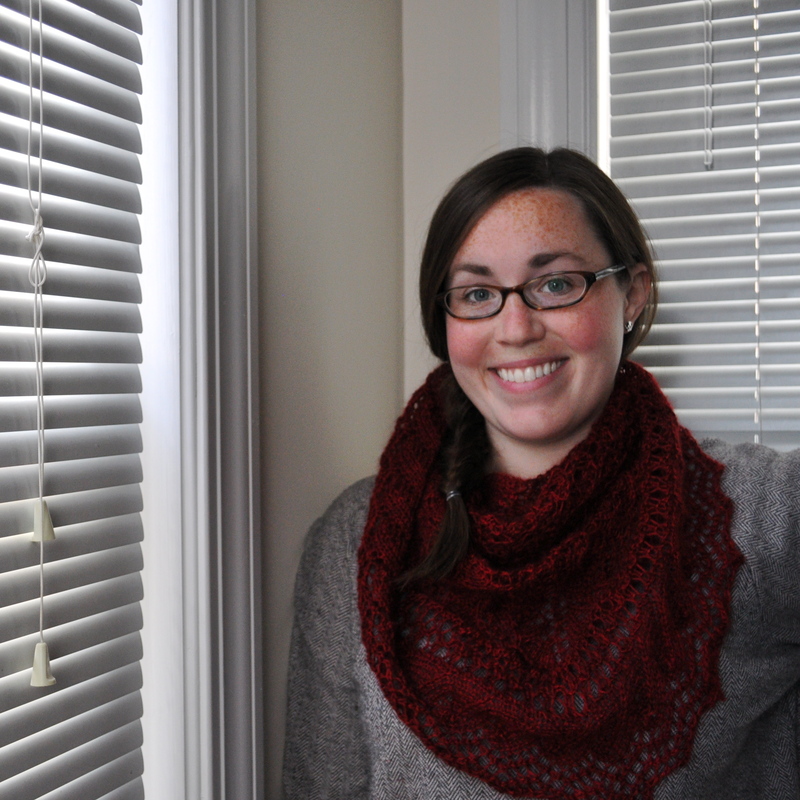 My goal was to create a cabled pattern where the cables led smoothly into the decreases. I hope that you feel I’ve s ucceeded! Pattern: Cable Me Pink Yarn: Sportweight Mohair Blend I’m offering this pattern as a free PDF, so please take it and enjoy. Although it has been test knit by me and proofed by other knitters, it may still contain mistakes. Please let me know if you discover any errors!